Sandy's small business victims: We don't want loans! 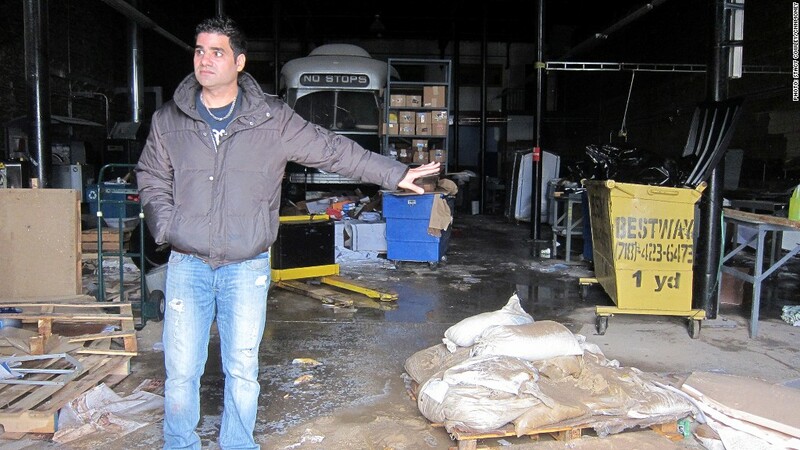 Mike Ikhmies, owner of commercial printing firm Eye Graphics & Printing in the Red Hook neighborhood of Brooklyn, shows the flood damage from Hurricane Sandy. Over and over, city representatives repeated one word: loans. The U.S. Small Business Administration offers low-interest disaster loans of up to $2 million over terms as long as 30 years. The loans are financed directly by the government and capped at a 4% interest rate. For a business loan, it's a remarkably good deal, and it's one of the federal government's main tools for helping small businesses survive crippling disasters. Red Hook's local congresswoman, Nydia Velázquez, repeatedly urged attendees to look hard at the SBA program. New York City is also offering bridge loans of up to $10,000 for area businesses that need working capital fast. But the assembled crowd reacted to that word -- loan -- like it was a four-letter epithet. "Most of us are deeply overextended as it is," said Monica Byrne, the co-owner of local restaurant Home/Made. "We're all shut down. We have staff we can't pay. We really need some support that's not about loans." Small businesses often run on razor-thin margins, juggling cash and expenses like blocks in a Jenga tower. One unexpected financial blow can send the whole thing crashing. Loans offer a quick cash infusion, but they have to be paid back. That's an added monthly expense many operators can't absorb -- especially if they're facing heavy rebuilding costs and weeks or months without any paying customers. "Money," said Mike Ikhmies, the owner of commercial printing firm Eye Graphics & Printing. "We need money." It will be an uphill fight to get any of it from their insurers. "No one in this room has flood insurance," said Jackie Summers, gesturing at his fellow business owners. That's not for lack of trying. Red Hook, an industrial waterfront community, sits squarely in the kind of high-risk zone insurers won't touch. Ikhmies said he carries fire, theft, liability and other coverage on his 13-year-old printing business. But when it came to flood insurance, the only coverage he could find had sky-high premiums and a too-small coverage cap. "They only went up to half a million," he said. "The equipment cost $4 million, $5 million. What good would half a million do if things got damaged?" That's the nightmare he's currently living. Ikhmies sealed his building up as Sandy approached, but floodwater pushed through the windows, covering all of the shop's printing presses in several feet of standing water. This week's projects are now papier-mâchéd to the warehouse floor. Two representatives from Brooklyn's Small Business Development Center -- a non-profit outreach program funded by the SBA -- toured Ikhmies' ruined plant Thursday afternoon, helping him photograph and document the damage. "It's heartbreaking," said J.M. De Jesus, an SBDC advisor. "We'll help with loan paperwork, but ..."
He trailed off, looking back over the piles of debris. Ikhmies has 10 employees, several hundred thousand dollars in outstanding loans on equipment that might be wrecked, and no incoming cash flow to pay for any of it. Jackie Summers is in the same bind. He's the CEO and co-founder of Jack from Brooklyn, an artisanal spirits business that launched just five months ago. On Monday, his entire inventory and all of his equipment were destroyed. "What keeps us afloat is selling stuff," Summers said. "We stop selling, the coffers go dry immediately." Risk modeling firm Eqecat estimates that Sandy's economic damage will be as high as $50 billion, of which only $10 billion to $20 billion will be covered by insurers. That leaves a huge gap -- one that could swallow many of the businesses in hard-hit and economically fragile neighborhoods. "Operating in this neighborhood is a labor of love. It's not something you do for money," said St. John Frizell, chain-smoking outside his Red Hook restaurant, Fort Defiance, as volunteers hosed down tables and hauled gear out of the soggy basement. 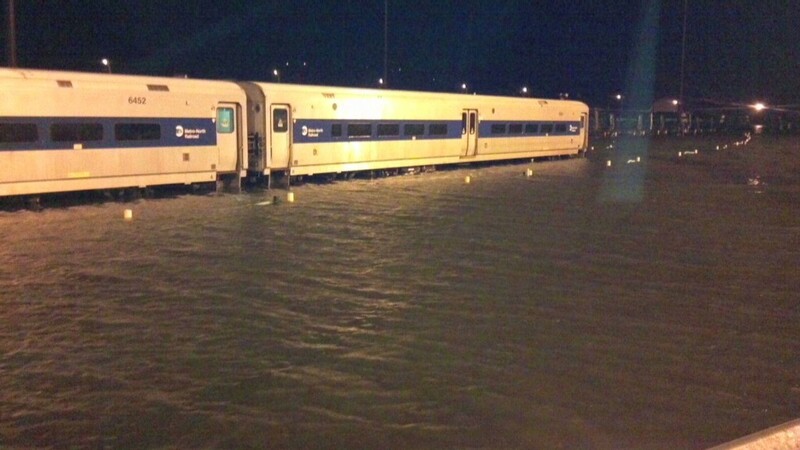 New York officials are promising to cut through red tape and help with the most urgent needs. Some sanitation rules are being suspended, allowing restaurants and shops to pump water out into the streets and use city services to haul away debris. Aid workers are hunting down generators, fuel and cleaning supplies. But when it comes to what business owners need most -- cash to rebuild -- there are very few options that don't lead in a direction most can't afford to go: deeper into debt. Ikhmies says he can't juggle yet another loan on top of the $25,000 he's already shelling out each month for an equipment loan with more than a year left on it. Refinancing might give his company breathing room, but the SBA's rules prohibit using disaster loans to pay off existing debt, according to agency spokeswoman Carol Chastang. They're intended only to cover damage and economic losses directly stemming from the disaster. Rob Walsh, commissioner of New York City's Department of Small Business Services, knows most business owners want more than loans. Still, he had few alternatives to offer. "There's contributions, promotions, benefits -- it's going to have to be the old-fashioned way," he told those at Thursday's meeting who said they couldn't afford to borrow more. Spirits maker Summers said Red Hook's business owners are pulling together to pool their resources: "It's a community here, and I'm glad to be among friends." But he's also aware that Sandy's wreckage may be beyond their financial means to repair. "I want to be positive about this, but the whole thing is tragic," he said.